restylingmag.com March 2015 | Restyling & tRuck AccessoRies 41 WWW.DAWN-ENT.COM 1.800.548.4867 Smittybilt Parent ComPany addS PoiSon SPyder brand Offroad parts company Transamerican Manufacturing Group (TMG) has ac- quired Poison Spyder Customs, maker of a variety of offroad and Jeep custom products. TMG already offers notable brands like Pro Comp, G2 Axle & Gear and Smittybilt Greg Adler, CEO of TMG, said Larry McRae, president of Poison Spyder, has po- sitioned the brand for success. "I really admire what Larry McRae has done in building a predominant brand so quickly," Adler said. "Poison Spyder is a great fit with our brands and our customer base. We look forward to developing the full potential of what McRae and his team has already worked so diligently upon." Along with the brand marque, TMG will retain all PSC employees, according to the company. "ere is a remarkable culture within our walls, and we look forward to wel- coming all Poison Spyder employees to our team," said Sean Angues, president of TMG. 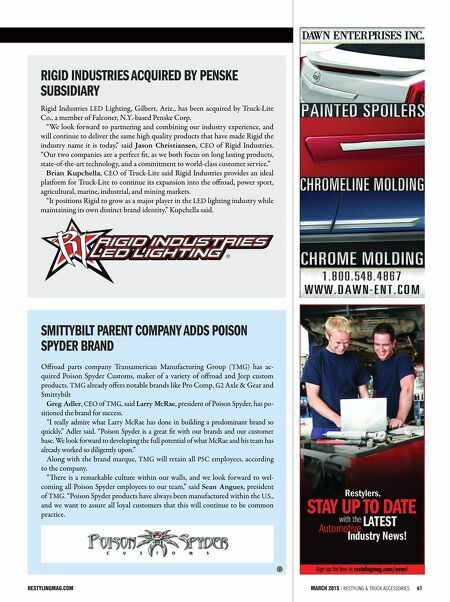 "Poison Spyder products have always been manufactured within the U.S., and we want to assure all loyal customers that this will continue to be common practice. rigid induStrieS aCquired by PenSke SubSidiary Rigid Industries LED Lighting, Gilbert, Ariz., has been acquired by Truck-Lite Co., a member of Falconer, N.Y.-based Penske Corp. "We look forward to partnering and combining our industry experience, and will continue to deliver the same high quality products that have made Rigid the industry name it is today," said Jason Christiansen, CEO of Rigid Industries. 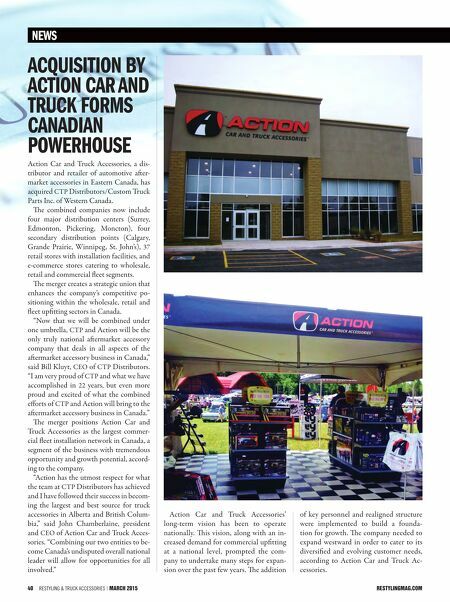 "Our two companies are a perfect fit, as we both focus on long lasting products, state-of-the-art technolog y, and a commitment to world-class customer service." Brian Kupchella, CEO of Truck-Lite said Rigid Industries provides an ideal platform for Truck-Lite to continue its expansion into the offroad, power sport, agricultural, marine, industrial, and mining markets. "It positions Rigid to grow as a major player in the LED lighting industry while maintaining its own distinct brand identity," Kupchella said.